TORONTO, ON / ACCESSWIRE / October 19, 2018 / Eskay Mining Corp. (''Eskay'' or the ''Company'') (TSX-V: ESK) (OTC PINK: ESKYF) (FRA: KN7; WKN: A0YDPM) is pleased to announce the completion of a 9,134 m, 11 hole diamond drill program on its SIB property, funded by SSR Mining Inc. (SSRM) (SSRM) (''SSR Mining''). The program was designed to test for precious metals-enriched VMS mineralization in the extensive and relatively under-explored stratigraphy beneath the Coulter Creek Thrust Fault (CCTF), correlative with that at the nearby Eskay Creek deposit (Figure 1). To date, only 521 geochemical samples out of a total of 1665 have been analyzed. Results will be released when all samples have been analyzed and interpreted. Full interpretation of the geology in the area is currently under review and awaits finalized data from downhole optical and acoustic televiewer surveys, and from the borehole electromagnetic and 3D induced polarization geophysical surveys conducted during the program. These will all aid in fully defining the geometry of the favourable stratigraphy, and in outlining drill targets. The additional geochemical samples are in the queue at ALS-Global Laboratories, which is independent from the Company, with sample preparation carried out at the ALS facility in Terrace, BC, and assays conducted at their North Vancouver laboratory. SSR Mining has the option to earn a 51% undivided interest in the SIB property from the Company by spending an aggregate of $11.7 million in exploration expenditures over three years with an option to earn a further 9% undivided interest by either delivering a preliminary economic assessment or completing an aggregate of 23,000 meters of diamond drilling (See April 26th, 2017 news release). The property under option to SSR Mining represents approximately 9% of the Company'land package in the Golden Triangle of northwest British Columbia. For further information regarding the SIB property, see the Company's Press Releases of October 17, 2016, August 8, 2016, May 9, 2016 and January 22, 2018. For further information regarding Eskay Mining Corp.'s prospects and showings at the Corey property, see the Company's corporate presentation entitled ''April 2018 Property Review and Targeting''. Eskay Mining Corp (TSX-V: ESK) is a TSX Venture Exchange listed company, headquartered in Toronto, Ontario. 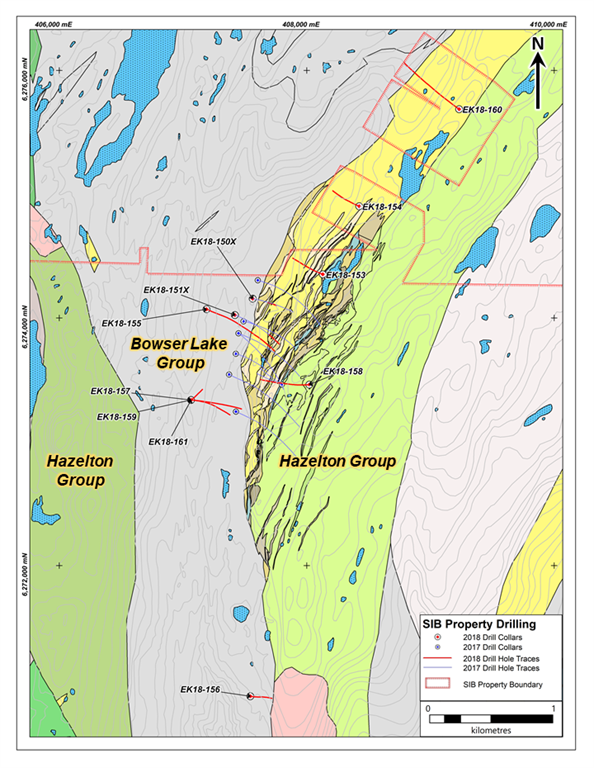 Eskay is an exploration company focused on the exploration and development of precious and base metals in British Columbia in a highly prolific, poly metallic area known as the Eskay Rift Belt located in the ''Golden Triangle'', 70km northwest of Stewart, BC. The Company currently holds mineral tenures in this area comprised of 177 claims (130,000 acres). Forward-Looking Statements: This Press Release contains forward-looking statements that involve risks and uncertainties, which may cause actual results to differ materially from the statements made. When used in this document, the words ''may'', ''would'', ''could'', ''will'', ''intend'', ''plan'', ''anticipate'', ''believe'', ''estimate'', ''expect'' and similar expressions are intended to identify forward-looking statements. Such statements reflect our current views with respect to future events and are subject to risks and uncertainties. Many factors could cause our actual results to differ materially from the statements made, including those factors discussed in filings made by us with the Canadian securities regulatory authorities. Should one or more of these risks and uncertainties, such as actual results of current exploration programs, the general risks associated with the mining industry, the price of gold and other metals, currency and interest rate fluctuations, increased competition and general economic and market factors, occur or should assumptions underlying the forward looking statements prove incorrect, actual results may vary materially from those described herein as intended, planned, anticipated, or expected. We do not intend and do not assume any obligation to update these forward-looking statements, except as required by law. Shareholders are cautioned not to put undue reliance on such forward-looking statements.